Designing the website for your business can be a challenging task, as you have to juggle the expectations of many stakeholders. Having a creative and attractive website design for your business generates a way to influence the mindset of people. Your website design deserves the best look; after all, it acts as the online advertising billboard for your company. While browsing through numbers of websites on the internet, every user strives for simplicity and clarity in the design. Want to make your visitors stay longer on your website? 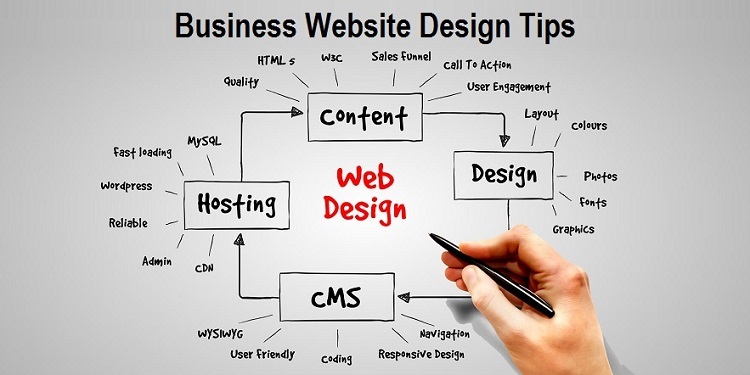 Then just follow some of these tips to enhance the look and feel of your website design. Packed with professional know-how, these website design tips will give you the brief idea of the efficient designing techniques that the design industry is buzzing about. The logo is always considered as the most important part of any brand – it displays the company on a grand scale. Do not forget to use the high-resolution image while creating a logo and just display it in the upper left corner of the page. Make sure that you create enough space between the content and images of your website so that the visitors can easily see the best features of your site. Controlling the white space of your website will highly enrich the user experience and thus increase the returns from the website. Try to use the neutral colors for your website, to give it a more clean and modern appearance. The color palette that can easily complement the look and logo of your website will surely add extra points to the appearance of your website. Highlighting the important content with vibrant colors will enable the users to grab the information in a quick manner. It is highly recommended to invest in attractive and professional photography. Interesting photographs draw the eye and attention of the visitor by establishing a stronger connection. People get immediately drawn to high-quality and creative images. Always keep in mind that people will look at your website not only on their big computer screens but also on their mobile devices. Sometimes the large fonts go well on the system but do not work well on mobile screens. So make sure that your font works well on both computers as well as on the mobile devices. Do not create the design or layout of your website directly on the screen at a rapid rate. Use a trusty pencil or pen to draw your design on the paper, to plan the overall layout of your website. The one design tip that can help you a lot in your work is to add the latest tools in your web design toolkit. As the world of website design is reaching new heights, it becomes very important for every designer to add new tools to his toolkit. Only with the help of latest tools, a designer can become able to makes effective and attractive website designs. Placing tons of links on your navigation bar is an old idea now, as it is not really contributing on holding the attention of visitors. The great way to cut down the amount of clutter that exists on your site is to eliminate the excess items from your navigation bar. Why creative website design is so important for your business? A well-design website always helps in fetching more customer conversions. A good site holds the attention of customers for good amount of time without causing any distraction or fluff. An elegant and creative website design always helps to connect more people with your site. Attractive website designs automatically send the message that your brand is useful and service based. More building the trust of customers or visitors try to make user-friendly pages. By taking the advantage of responsive website design, you can gain a new set of customers. As most of the people now use smartphones for browsing things, so you can easily fetch more visitors by making a responsive website. Hope all these above-mentioned website design tips will help you to create well-thought-out website designs based on the expectations of clients. So, bring more life to your website designing career by implementing these tips in your next creation.